The Hospital Tennis Club was formed in 1978.Tennis was played on the one court located in the grounds of Letterkenny General Hospital. The club developed into one of the leading tennis clubs in the north west.By the 1990’s it had 40 members plus children.There were six senior teams and one junior team participating in the Donegal Tennis League.Membership had to be restricted due to the fact that there was only one court. Due to the demand for increased membership,junior coaching needs the time had arrived to provide facilities to cater for the huge demand for tennis in Letterkenny.Apuplic meeting was held in Gallaghers hotel in 1993 and a large turnout attended.It was agreed that Mamie Bonnar and Alan Graham would approach Councillor Bernard McGlinchey. 40,000 Punt had to be raised and the Committee successfully raised this money by way of life memberships etc. An agreement was drawn up that if the courts were not built within one year the life memberships would be given back. Luckily this was achieved and a lotto grant was secured to fund the remaining cost of building the four courts. The final choice of site was Murric-a-boo on the High Rd and the property was leased from the urban council for a nominal rent. 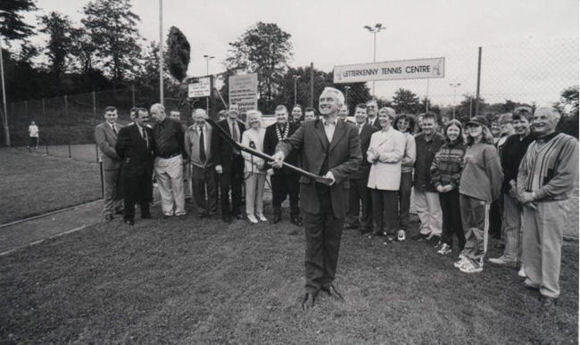 The opening of the Letterkenny Tennis Centre was held on the evening of Thursday,24th of August,1997.